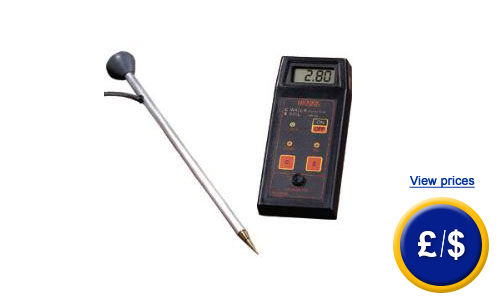 The conductivity meter is customized to determine the total mineralisation of soil or grounds. Thus via the conductivity meter there can be gained information relevant to evaluate the ground quality and the application of fertiliser. The sum parameter conductivity gives information about the presence of minerals. The amount and sort of mineral provides information about efficiency in growth. A mineral deficit always results in plantation damage. Regarding irrigation a profound knowledge about the conductivity of the water is an important factor in agriculture. A permanent control by means of the soil- conductivity meter is a significant plus factor. Here you will find some more conductivity meter. If you have further questions concerning the conductivity meter, please take a look at the following technical data or use our hotline: UK customers +44(0) 23 809 870 30 / US customers +1-410-387-7703. Our technicians and engineers will be pleased to give you further information regarding the soil- conductivity meter or any other product in terms of regulation and control or scales and balances by PCE Instruments. 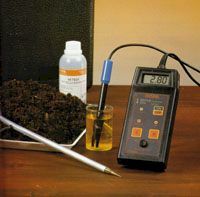 The conductivity meter stands out due to the two sensors for soil and liquids as well as the two measuring ranges for salinity and conductivity. An alarm goes off, if the amount of nutritive medium (azote and potassium) is deficient or if the soil is to dry. In this case the sample has to be wetted with distilled water and then be checked as soil solution (see description of soil solution below). 1 litre distilled water and seal bottle. Shake or stir (use magnetic stirrer) the sample for 10 min. Wait 5 min, so that solid material settles on ground of bottle. Measure conductivity in overlaying lose phase of liquid (the solid material should be settled on ground).